a) Is α-D-glucose an acetal, hemiacetal, ketal, or hemiketal? 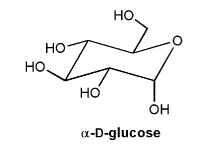 b) Draw the carbonyl form of α-D-glucose. a) You can spot the carbonyl carbon because it's the one with two oxygens bonded to it (oxidation state II). The carbonyl carbon has an -OH (alcohol) bonded to it, and not an -OR (ether), so it's a hemiacetal or a kemiketal. The carbonyl carbon also has a hydrogen bonded to it, so it must have come form an aldehyde (instead of ketone). So it's a hemiacetal. (remember: aldehyde -> acetal, ketone -> ketal). b) The hemiacetal carbon's -OH (or -OR in the case of a ketal or acetal) is the oxygen that used to be the carbonyl C=O. MendelSet practice problem # 715 submitted by Matt on July 23, 2011.